Mahler is not the first composer associated with Sir Adrian Boult but he was quite familiar with the music and one should not be surprised to find him at home with Mahler’s eclectic idiom. Slightly more surprising is the ease and virtuosity shown by the LPO here. Their playing is superb, especially the lovely horns and woodwind, who nail both the notes and the style as if they were as familiar with the music as the VPO. At times, their playing is deliberately slightly raw, so there is no danger of too “English-sounding” a refinement. This, by any standards, is a swift, direct performance. The next fastest I know is just under fifty minutes from Paul Kletzki with the Israel Philharmonic recorded four years earlier and of much less quality. Otherwise the tendency over the years has been to get slower, thus most recordings clock in at around the mid-fifties mark, so Boult is pacy by any standards. That approach pays dividends in the excitement of this recording but that is not to say that Boult is in any way monotonously driven or negligent of the more reflective sections of the music. The opening, for example, is suitably mystical and otherworldly before relaxing into a genial and even humorous account. He then moves on from his relaxed mode to crank up the tension, driving on to a wonderfully exuberant conclusion. The Scherzo could have turned out to be manically fast in the wrong hands but its high spirits never spill over into hysteria and Boult makes telling use of dynamic contrasts between sections. He presses on in the famous Forest Funeral March of the Animals, slyly accentuating the dance rhythms. The Finale positively explodes with nervous energy. 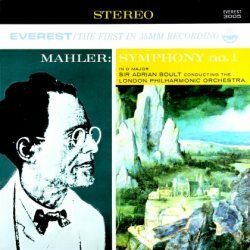 This is Boult just getting on with it, providing the antithesis to the reverential, “spiritual” approach to Mahler which does not in fact really suit this deeply ironic symphony. As such, it constitutes a refreshing alternative interpretation. This is one of a whole series of newly re-mastered re-issues of the famous Everest LP catalogue. Consequently they are short-measure compared with new recordings but priced accordingly. There is some slight hiss and at first the sound seemed to me to be a little "papery" but otherwise it still sounds terrific. The Walthamstow Assembly Hall provides a big, resonant acoustic without obscuring detail.